There’s a stretch of white slush covering my lawn, but the leaf blowers are gone. Finally the engines of mowers, clippers and blowers are silent and for the quiet spell of winter; like Carl Sandberg’s buffalos, they’re gone. As the cold pushes us inside, it’s good to have the oven on sending good smells of baking through the house. The holiday season is upon us with party food on order– time to make sure there’s a bag of crisp, cheesy puffs in the freezer to pull out at a moment’s notice. My mother didn’t care much for cooking, but we had farm produce around needing to be used, so basically everyone had to know how to cook. With our family Jersey providing quarts of rich cream for the fridge, my mom became an expert with cream puffs. We seldom see them anymore, but what a treat they were—those crisp egg-rich golden globes filled with lightly sweetened whipped cream and a dusting of powdered sugar. Cream puffs were our go-to dessert for company or Sunday dinners. 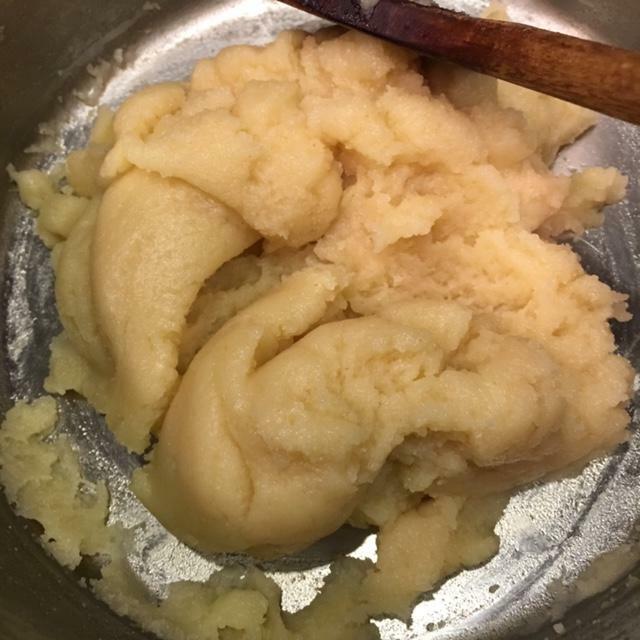 So as Cleo whipped up cream puffs, so I, too, learned to take the preparation of the classic pate a choux for granted. Once you dive in, you’ll see it’s a snap. 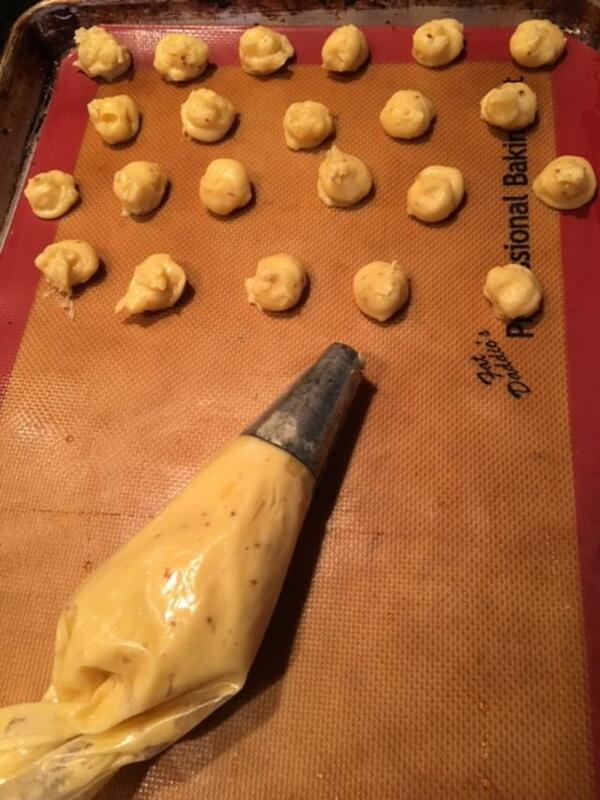 greased sheet pan, parchment or Silpat mats and popped into a hot oven, the pastry bursts into hollow balls. 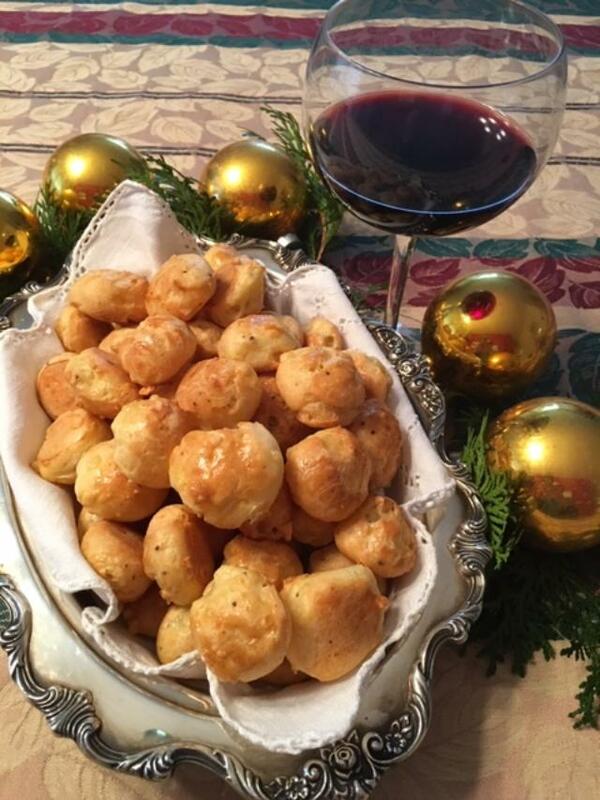 To turn the paste into the classic Burgundian Gougeres or cheese puff, add a dab of mustard and some good Swiss type cheese to the paste before baking and you have a delicious little appetizer. Light, classic and always welcome. 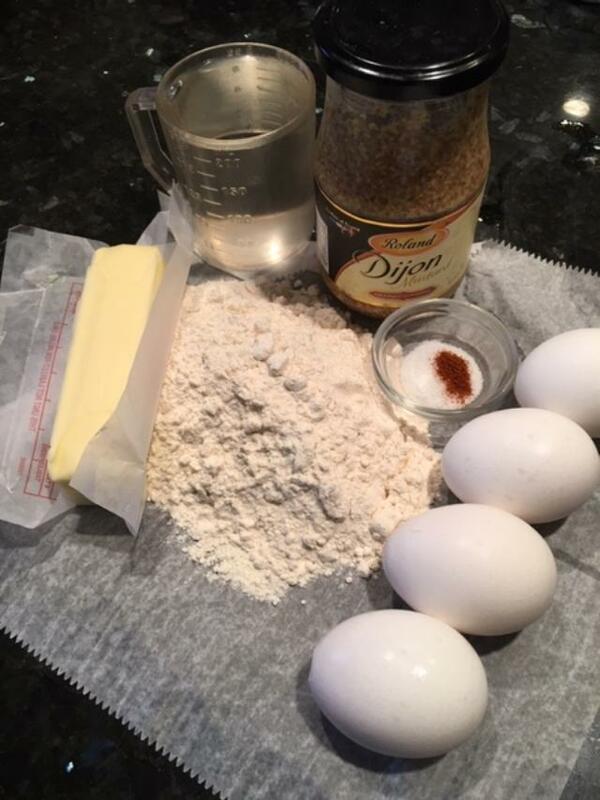 A few tips I’ve learned over the years: use strong flour or bread flour in place of all purpose flour if possible for a better puff and stronger shell; cut the cheese into small dice rather than using grated cheese for little melted nuggets; stick with water as the liquid rather than using milk which makes the pastry too tender. 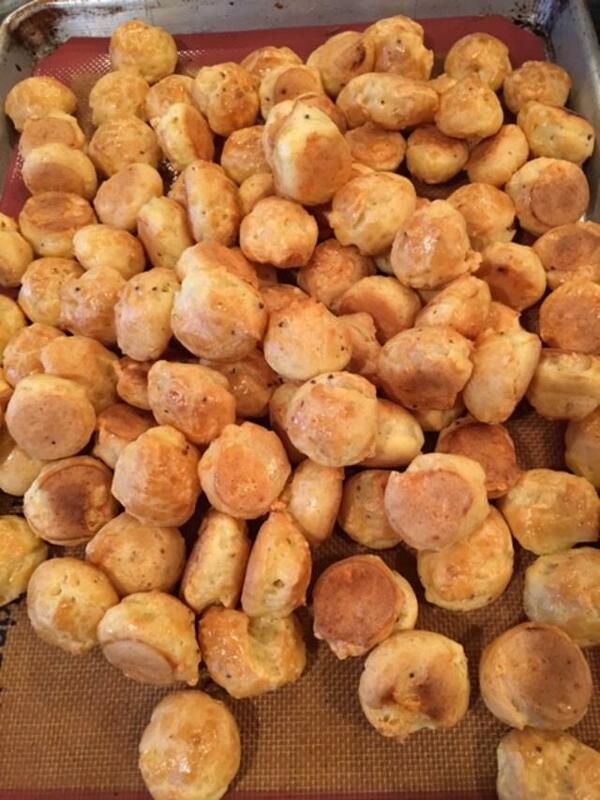 I’ve made thousands of these puffs over the years, so don’t fear giving them a try. No fancy equipment needed. They may be pipped onto the sheet pan using a pastry bag and wide plain tube if you have them, or simply dropped off the edge of a spoon. Make them tiny if you have the patience, or a bit bigger if you’re in a hurry. 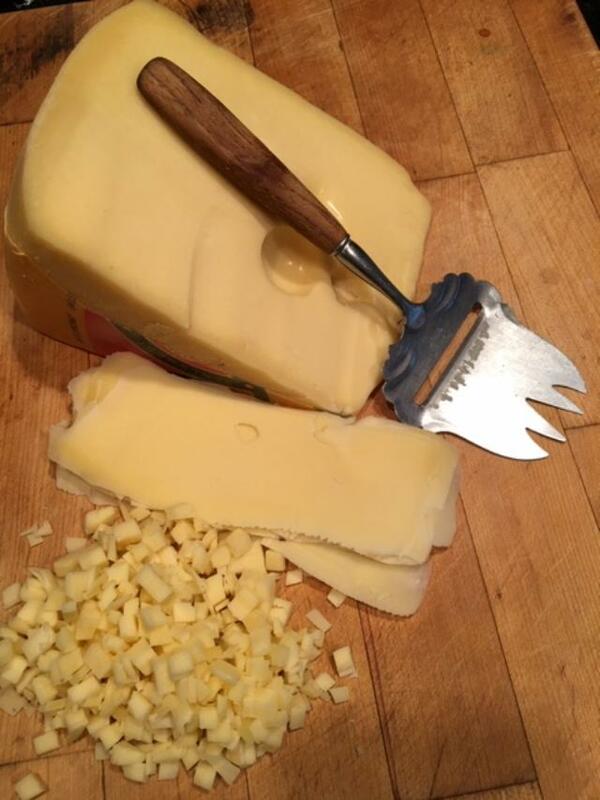 *If using extra large eggs, save 1 generous tablespoon aside for egg wash.
First prepare the cheese, by pulling slices from the wedge with a cheese plane.Stack up the slices and cut into small dice (see photo) or use large holes of a box grater. Preheat oven to 425º. Line two sheet pans with parchment or Silpat mats. In a medium saucepan (not enameled cast iron which retains too much heat when eggs are added), combine the water, butter, salt and cayenne. Cover and bring to a rolling boil. Have the flour and a strong wooden spoon at hand. 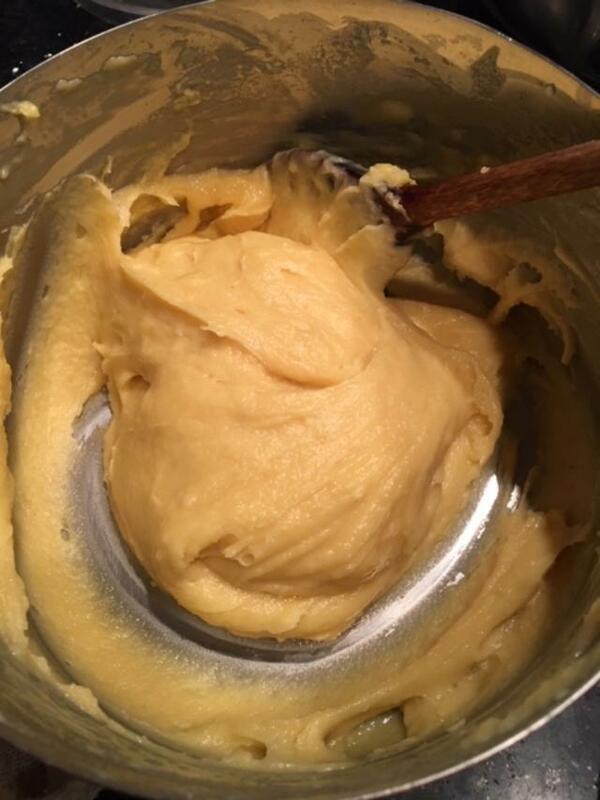 Once the butter has melted and the boil is rolling, dump in the flour all at once, stir like mad, reduce heat to simmer and beat until the dough comes together into a soft ball. Stir the paste over low heat for a minute. the tops with egg wash (beaten egg) and pop the sheets into the preheated oven. Bake for 15 minutes, then reverse the sheets, top to bottom. Bake another 10 minutes for small puffs and a bit longer for larger ones. Remove from oven when crisp and brown. 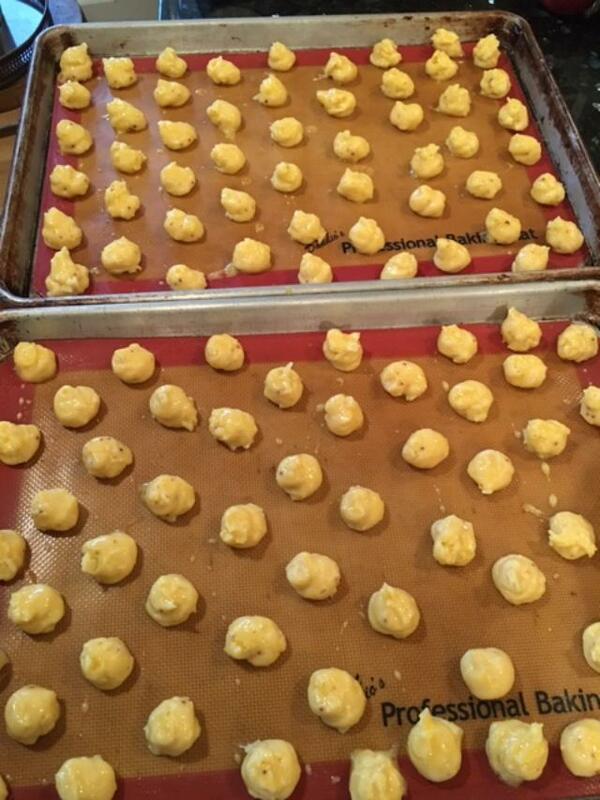 To freeze spread baked puffs on a sheet pan and freeze before storing in a zip lock plastic bag. The puffs may be reheated from freezer to oven for a few minutes before serving. Cheers! You are currently browsing the Mary Jo's Kitchen blog archives for December, 2018.